Fly screens are designed to prevent files from gaining egress into buildings via doors and windows. This will work for both private and commercial premises. We manufacture our own screens specific to size in a white or brown colour. Measuring is easy and we supply and fit. 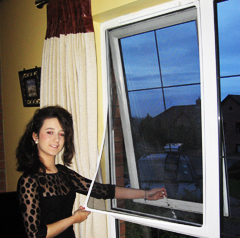 We also supply and fit Insect Screen Doors and Strip Curtain Doors. During warm weather everyone wants cool fresh air in their premises. Unfortunately this gives flying insects the opportunity to come in and cause not only a nuisance but also a health hazard. Fly screens provide an effective exclusion mechanism for preventing flies from entering your premises. This can be especially important in commercial sectors, such as the hospitality and restaurant trades. Contact us today to discuss our fly screen solutions.